attends "The Hateful Eight" press room during Comic-Con International 2015 at the Hilton Bayfront on July 11, 2015 in San Diego, California. Try not to flip your wig, Donald Trump. The GOP presidential candidate, who hosts “Saturday Night Live” this week, sports slightly-more-ridiculous-than-usual hair in a new promo for the episode. 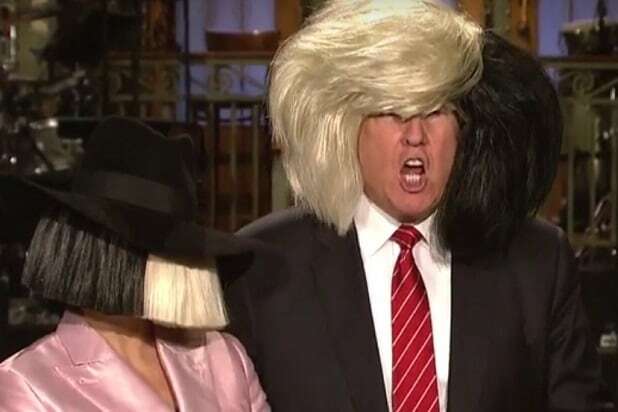 “Sia, I love this hair!” Trump says in the promo. Well, it’s definitely not low-energy. Watch Trump wig out in the video.